This piece titled 'Island in the Lake' was created for an invitational show in Lake Oswego, Oregon, USA. David created this piece as an interpretation of the spirit of the town of Lake Oswego, which in turn is named for its distinguishing feature of a small manmade residential lake. Hundreds of houses line the edge of the lake and in the lake is a small island with a single house. The top frame is maple (Acer campestre) with hammered brass sheet and tubing accented with African blackwood (Dalbergia melanoxylon). This imagery is a response to the rectilinear nature of the building and bridge. David comments that, as a larger 420mm (169â„16in) piece of maple burl, it was challenging. David tries to turn as many large pieces as he can, knowing that someday he may not be able to grapple with 100lb blocks of wood. Maple burl native to Oregon can yield spectacular results of grain pattern and colour, and David loves to turn it. David works as an architect and manager during the day and this job largely consists of problem solving and paperwork. 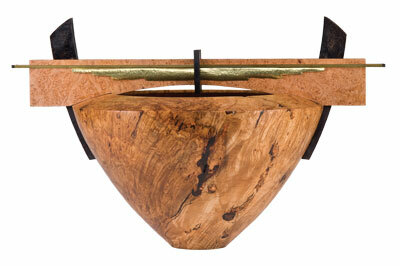 Woodturning is his opportunity to be creative and work with his hands. His design background definitely tends to influence his pieces. "At the end of the day, the tangible creation of something in my workshop gives me a measure of satisfaction that paperwork never will," he says.